When we purchased our little Santa Fe, one of the first things we noticed was that the front and back body panels had some pretty severe cracking. Fixing them has been on our “to-do list” since we bought the camper. This year we decided to get serious about cleaning up the outside of the PUP, so the body panels were the first thing we tackled. Wow! That camper was long overdue for a cleaning, huh? 🙂 You can see the major cracking we have going on in the front panel. It was more severe than the back panel because it gets all the rocks and debris that flip up from the tow vehicle. We priced out new body panels, but they were over $300, and that was definitely not in our budget. You can see how severe the damage was. There were places on the panel that were barely hanging on. After a little research, we decided that since our ABS roof repair went so well, we’d use the same method to repair the panels. The first thing Mr. TypeTwoFun did was remove the panels from the camper. 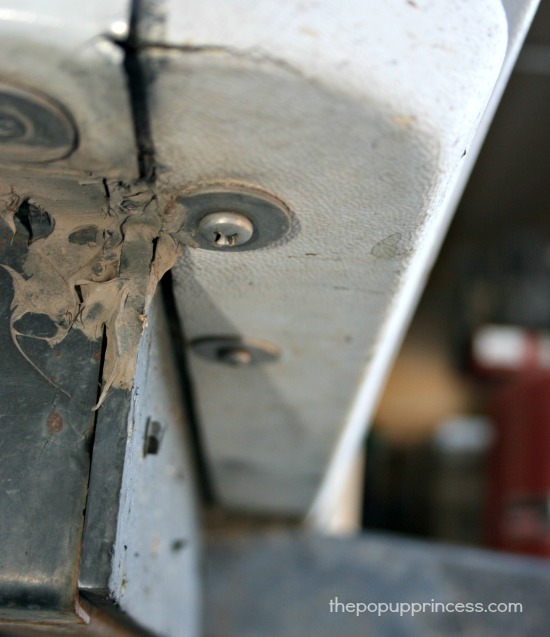 The body panels themselves are attached with screws along the top and bottom. Mr. TypeTwoFun first removed all the lights along the camper. Once you pop off the lenses, you’ll see that they are all attached with pop rivets. We drilled out the rivets, just like we did when we replaced our stepper door lock. Then we removed all the screws from the top of the panel. 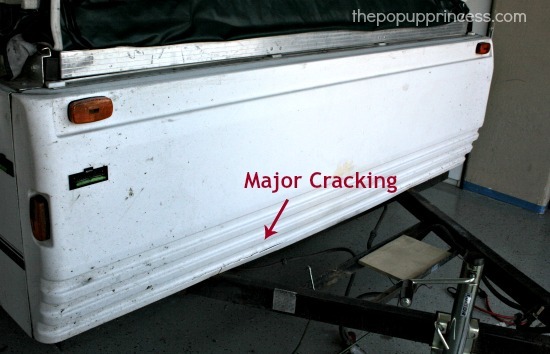 Be sure to label everything you take off the camper so you’ll have an easier time putting it all back together. We put all of our screws in Ziplock baggies and labeled them, and we did the same with our marker and tail lights. On the bottom, you can see that there are screws and washers holding the panels in place. Just remove the screws and washers, and the body panels can be taken off pretty easily. Mr. TypeTwoFun found that, at the top of the panel, just underneath the bunkends, there was some sort of adhesive, probably silicone caulking, between the metal plate and the body panel. 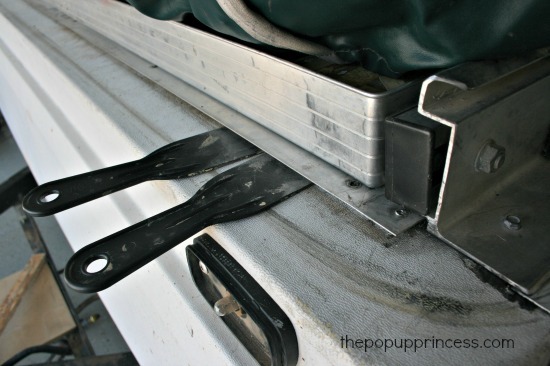 He took a couple of plastic putty knives and slid them underneath the metal plate to loosen the seal. Once he did that, the panels popped right off. What is MEK? Where do you buy it and ABS plastic powder/granules? Have you ever used the (higher) VOC Liquid Nails Heavy Duty adhesive? Works very well esp. with polypropylene (slippery) plastic. Also suggest using fiberglass mesh to reinforce cracks. Even mesh for drywall joints will work esp. if multi-layered. I’m sending photos of our Aliner solid-wall folding camper supposedly the most photographed RV in North America. Your readers are invited to visit our website for POI listings of places to visit. We have THOUSANDS of listings. It dissolves the plastic??? I’m a newbie and fixing this on my own. Do I want it to dissolve it? MEK dissolves the ABS plastic pellets and makes a “goo” that is the consistency of white glue. You’ll use this goo to repair any cracks you might have in your panels or ceiling. You can read a little bit more about that here, Kim. Just a thought… On our abs roof we used some of our sons white Legos!! (He has about 100,000! ☺️) worked perfect! We found this little tip at popupportal. I too did some moderately major damage to my old camper. A concrete post jumped out at me at Disney’s Camp Wilderness a few years ago. It turned a crack made by the previous owner into a hole big enough to slide my hand into. I looked into buying another panel too but was also scared off by the price. So I decided to give fixing it myself a shot. I found a VERY good article here: http://ewmag.epoxyworks.com/ewmag/28/pdf/Camper_panel_repair.pdf and I was able to do it myself. We just got a 1976 coachman, it has a hail dented aluminum roof, do you think bondo would fill the divets alright, then coat the whole roof over that? Did you research ABS/MEK repair for TPO panels before this project? Are yours ABS or TPO? I may or may not have run into my Coleman Cottonwood with my riding lawnmower, and the blade engage handle may or may not have punctured my front body panel. Mine is TPO, and I’ve seen how to repair that on other sites, but I didn’t know how easy it was to remove the panel. Your blog will come in handy for June repairs. We’re going to tackle this project this coming weekend. We too said “no way” to an ABS roof until a deal too good to be true came along. So much for sticking with my guns! Can you provide a link to the type of MEK you used? Also, what was your ratio of MEK to ABS pellets? 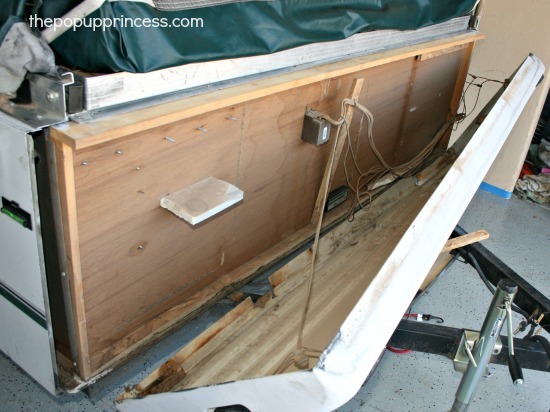 Larissa, Our PUP has an ABS roof that luckily has not needed repair. I have been following you and popupportal for years now just to be in the know. Well, I think we now have a repair that is needed and I think this process may help us. We went on vacation, without our PUP. We had a carrier (like a Thule) on top of our van. When we got home, my husband forgot it was up there and he drove into the garage with it still on. It popped back into shape, but it now has a small crack about 1 long. I was thinking this process would work to fix it. The Grizzly Grip seems to come in quantities larger than we need, therefore it is quite a bit more than we want to spend for this repair. Gloves- Did you all use the black gloves for hazardous materials? It isn’t actually a Thule, just one like it. They sell it at Walmart. I can do some research to find out. Thanks for the GG info. I’m starting to consider a different process because of the GG. I would use it on our PUP’s roof if it needed it, but it doesn’t and they are different colors. Today I had a friend ask me about buying a PUP. I referred her to your site, popupportal, and Popup Owner’s FB group. Out of curiosity, what year is your Santa Fe? We just bought a 1999 Santa Fe and are really looking forward to doing some of the same mods, remodel, and maintenance you guys did. Thanks for sharing! Once done, how did you reattach the panel? 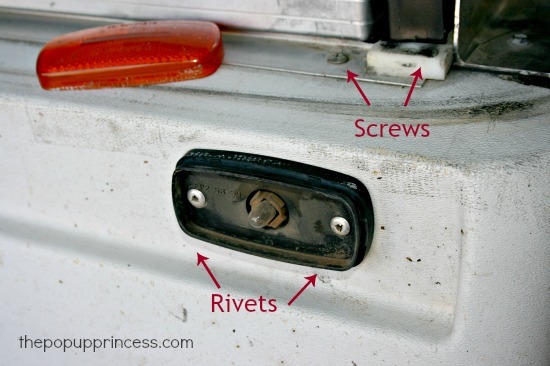 Do you need to use rivets or can screws be used where the rivets came out? Mr. TypeTwoFun says our panels were attached completely with screws. We just screwed the panels back on. Now, there were rivets attaching the marker lights. You’ll need to reattach those with rivets, but if you have a good rivet gun (like this one), it’s quite easy. Those look great. I have mine off and they are currently drying with the MEK on them. One question I have is did you ever paint the rest of the PUP? If you have and I missed the link sorry but that is next on my todo after I finish the Grizzly on the roof and panels. 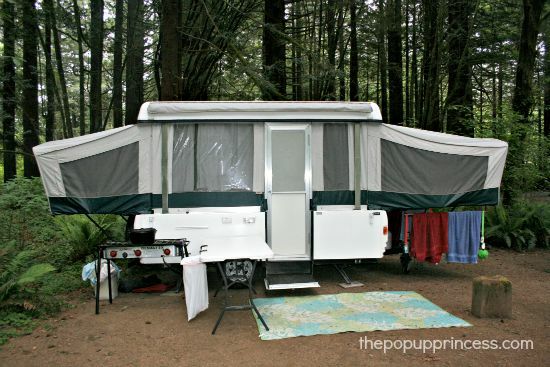 Have you done this post yet regarding painting your pop up? I’m anxious to read about your process as I’m needing to do the same soon. Love all of your posts BTW…thanks for doing it. I have been trying t figure out how to get the front Panel off our 2002 Sun Valley. I finally figured out how to get all the screws out and your tip on the sealant under the metal trim allows me to finally get the thing off. The sealant under mine was a black sort of tape. I have not been able to find anything like it to replace it with to put it back together. What did you use in its place when you put yours back together? Mr. TypeTwoFun just ran a thin bead of caulk along the edge of the body panel before he put it back on. It worked great. We were given a 1989 Jayco trailer that is fairly good shape. Needs a lot of cleaning and some dry rot roof repair. Luckily the previous owner had bought canvas for it prior to giving up on fixing it. I have been trying to figure out how to take the roof apart and how to replace the trim that covers all the edges. Is that something that you have done? With it being an old trailer I am not sure where to get new trim pieces or if we will be able to use the old. We plan to rebuild the roof to have a slight slant for water run off and are looking into solar panels. How has the repair to the front panel held up so far? I am about to attempt the same repair as soon as it warms up. Do you know of any tips on repairing a alumatight roof? The panels have held up very well so far, Tony. We’re very pleased with the results. We don’t have any experience with alumatight roofs, but have you tried the Pop Up Portal? There is sure to be someone with an answer over there. We have a 1997 Fleetwood,/Coleman-Sun Ridge. We are in the process of renovating it. Your postings will help us a great deal. We will keep you posted. Thanks for all of this info. Hello, just wanted to let you know that I love your sight . So many ideas. I was given a 1997 Jayco Eagle Pop-up Tent . On the front corner of it the trailer is coming apart on the corner due to rotting and swollen wood under neath . The outside is aluminum has anyone fixed something this damaged we’re scared to take it apart and don’t know if it can be put back together . Has anyone fixed anything like that if so please, please post pictures. 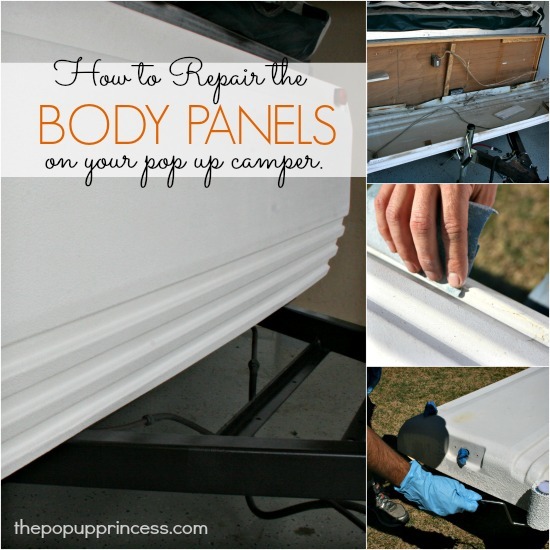 You should do a how to on body repair for those of us with aluminum bodies. Or, do you know a good source for such a thing? 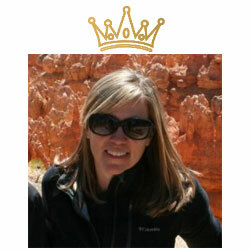 As always, your blog is the best! I have tried the MEK/ABS repair with Grizzly Grip as you suggested but I ran into a couple problems. First, the Goo, once it dried did not want to stick to my panel. It kept flaking off very easily. The ABS I used was from plastic spoons bought at a local party store, which was much cheaper than trying to buy legos. Perhaps I need to look into another source for the ABS plastic chips. Where did you get your ABS from? I even broke down and bought a plastic welder, which worked for a few of the cracks but the major ones on the storage box deck lid, i can not seem to find a suitable repair for do to the expansion and contraction of the ABS with temperature changes. We recently inherited my dad’s 1995 Rockwood Popup camper. We have a few questions. First of all, we have some roof latches pulling away from the side wall. It appears that there was water coming in behind the screws. Anyone have some feedback on how to repair this? Lastly, we are going to take our popup on a long trip through Colorado, Wyoming, Montana, Washington and Oregon this summer. I am a little nervous about hauling our popup camper that far and through mountainous terrain. I would appreciate any feedback on how to prepare our popup for a long road trip. I don’t have any first hand experience with any roof other than the Coleman ABS roof that ours has. It does sound like you’ve got some water damage, though, Connie. That might require a roof rebuild or repair. You will definitely need to get in there and see if there is damage to the wood in the roof. That might be causing your issues. Check the PopUpPortal for more information on that. There are some amazing people there that are sure to have the answers to your questions. Hi. Your camper is so adorable. We just recently bought an old camper and are fixing it up and I was wondering the kind of paint you used for the exterior? Also dd you finish it with something? Totally Understandable! Thanks for the info. I did the ABS top repair with the ABS beads and MEK then the white Grizzly Grip coating toward the end of last year. During installation of a Fantastic Fan I was able to re-adhere the top to the foam core with Gorilla Glue. The top looks great and we have hopes that it will outlast the rest of the trailer now. We bought a 1997 Coleman Sunridge with two king size beds. Love your tips and repairs and updates. One update that I did was to add two LED lights when I installed the fan. I used electrical track for the wiring and built a slimline junction box between the fan and the power source: the existing light. I ran track from the junction box to a point over the table and over the sink/stove area and added lights over each. All interior lights are now LED. Thank goodness you have this site!! This blog saved us. While rewiring tail lights, one wire slipped back into the tiny hole. We were gonna cut from inside the dinette seat to reach wire. Luckily I read this before cutting holes into our pop up. We followed your instructions, retrieved the fallen wire and all is connected. Thank you for sharing your remodeling and modifications. This site has been SO HELPFUL!!! How are your panels holding up 2 years later? We need to repair a couple of small cracks on our Coleman body panels this year and we are looking at our options. Thanks! Can you use this process on aluminum siding that has been painted? 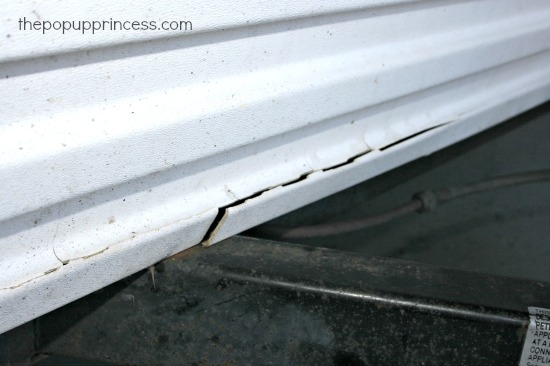 I have a Shasta rv that has some pretty bad damage to it . You wouldn’t be able to patch aluminum siding with ABS plastic, Amanda. We recently repaired the aluminum roof of our new project camper with fiberglass Bondo. That worked really well. You can find that post here.